They use a 10″ rhombus (diamond) template that they make themselves, and they end up with fewer, much bigger, stars which are all one colour. 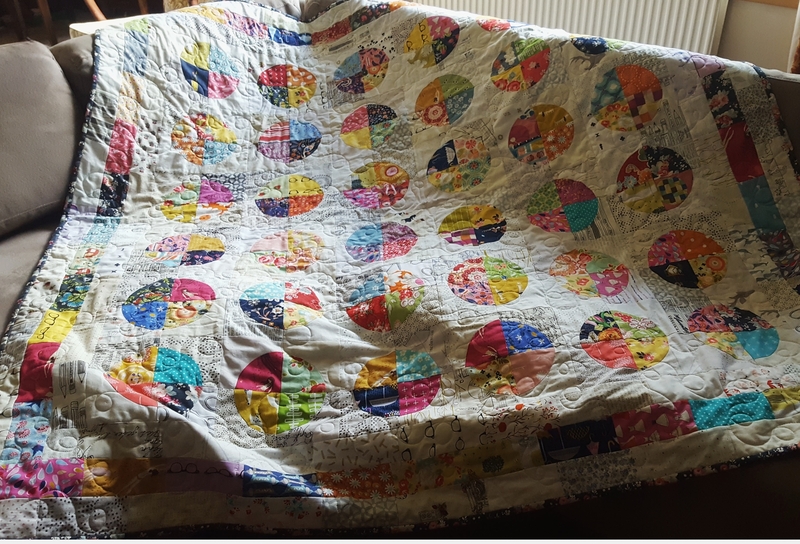 This is a picture of their lovely quilt. It’s the same method, but it looks quite different! 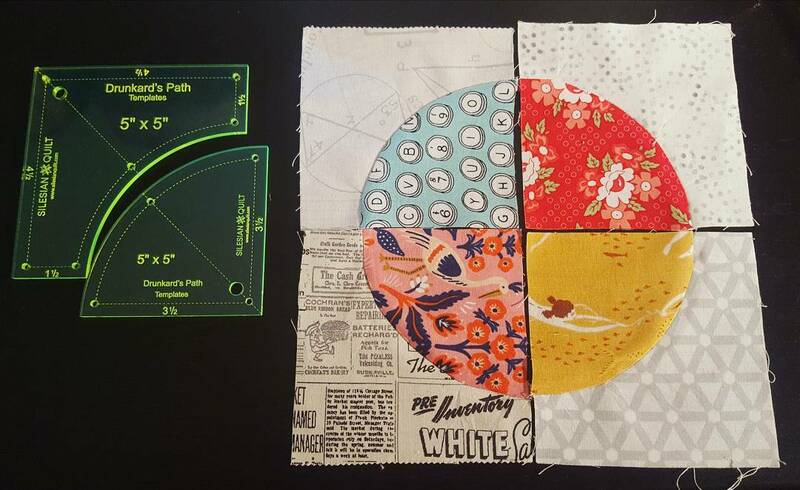 Anyway I watched the tutorial and on a total whim looked online and found both the 10″ template and the 5″ template online at http://www.thequiltshop.co.uk, and, hoping that 5″ meant it would fit charm packs (it does), I bought that one. You guys know my weakness for charm packs don’t you? Well, anything that fits those babies is a winner in my mind. So the next day it came, and without any real idea of how it would look or how many diamonds I needed to cut or if I was making a quilt or what size it would be or really anything, I picked out charm packs of Tuppence and Acreage by Shannon Gillman Orr (I only just realised they were by the same designer! Talented lady), Little Miss Sunshine by Lella Boutique and Bread & Butter by American Jane all for Moda – and cut a whole heap of diamonds. Followed by a bunch of white triangles. I know, vague. Then I made half-stars as directed by the video until I got bored. So I had a load of diamonds left over and three half star blocks, because yes, I totally cut with joyous abandon and no plan. I’ll tell you what you need to cut later so you don’t make that mistake! This is it in the process of laying out the half stars. Can you see what I mean by half stars? You sew each diamond to 2 white triangles, then sew three of those units together to make one “half star hexagon” shape. Then you sew them in rows, alternating whether they are up or down. Seriously, I maybe was distracted and didn’t notice I was sewing hard, but it all seemed to go together really fast. From zero to the above picture in a few hours, from that to the picture below in a few more the next day. Of course in these pictures it’s been quilted too! I used Bosal Katahdin 100% scrimless batting in Autumn weight which I bought a roll of and I’m playing with. 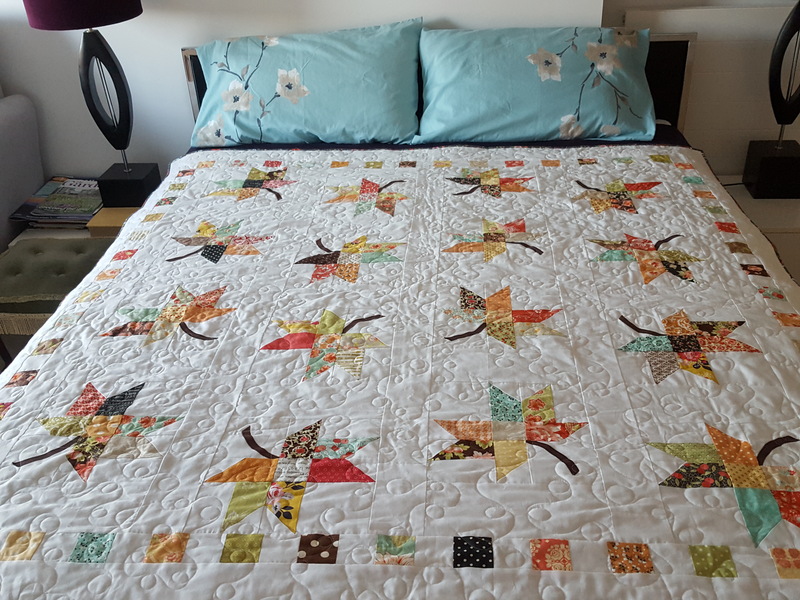 I like it a lot, great quality, can quilt up to 8″ apart. I’m going to say I still prefer Quilters Dream, but it is cheaper, so there’s a very good reason to keep some of this on hand too! 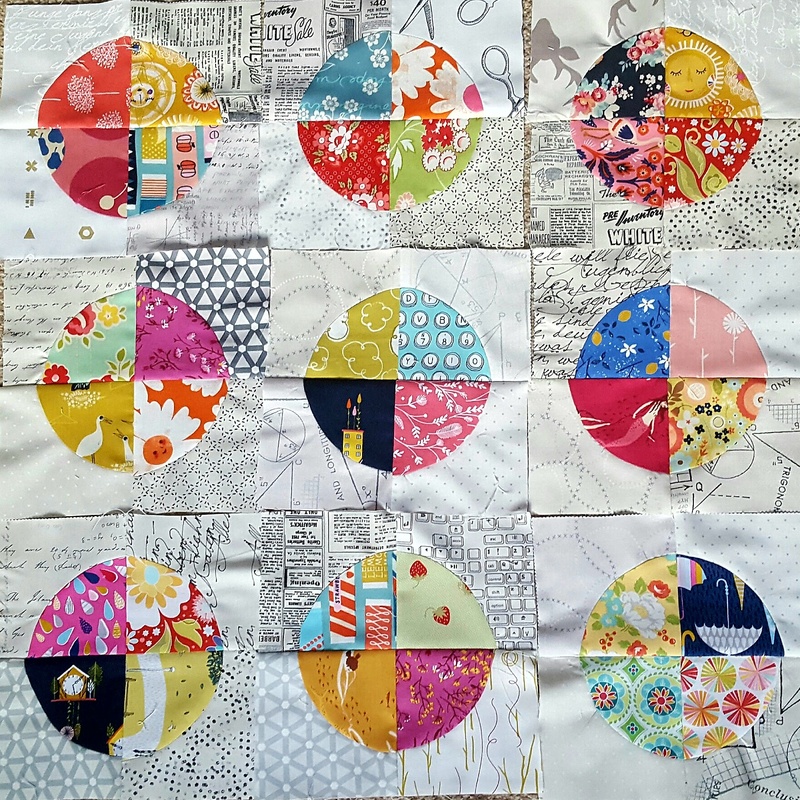 Quilting pics! 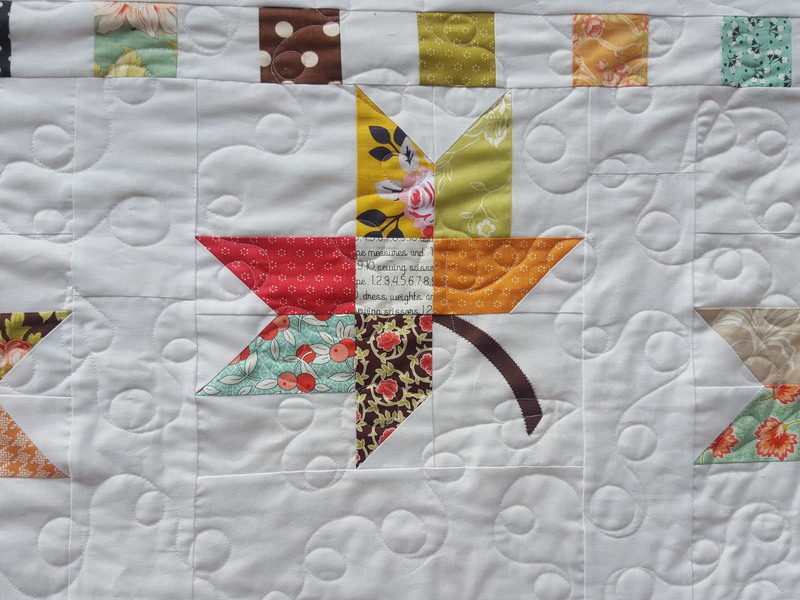 I quilted a loopy meander punctuated by little stars. 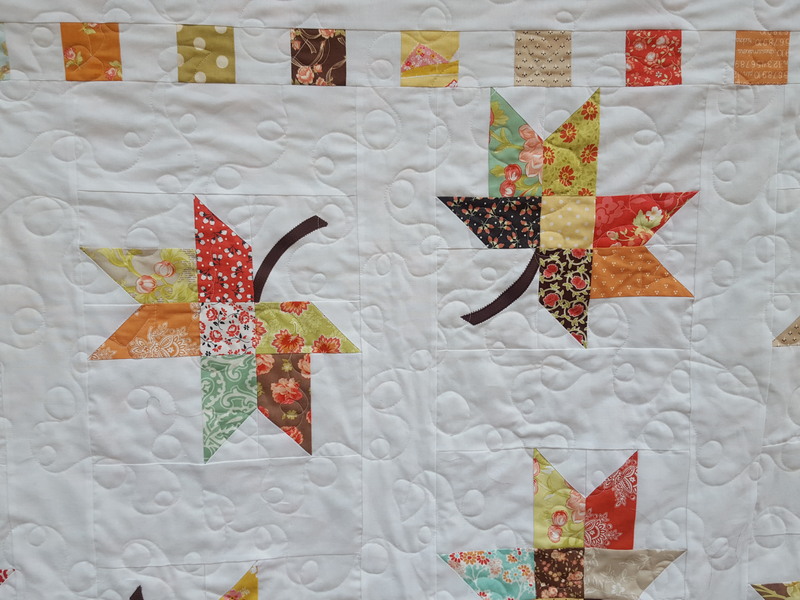 I love those stars; they’re sweet, they’re fun, they reflect the quilt and they give you a great place to stop and turn around in your quilting! And that’s the back. Almost my last piece of IKEA’s nummer fabric. 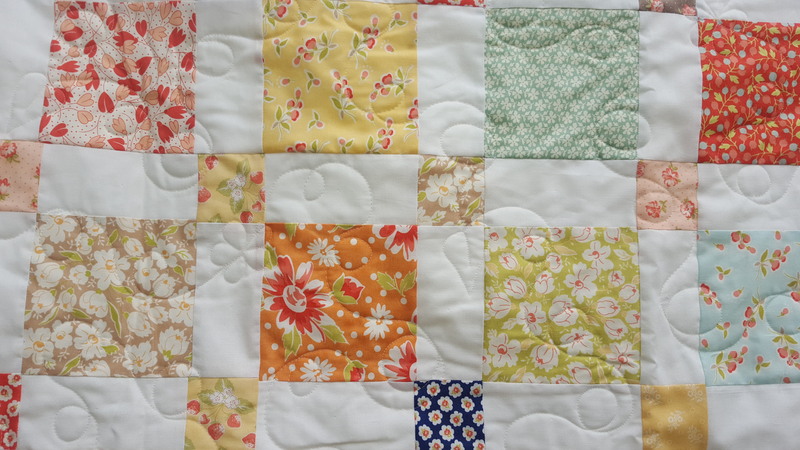 It’s now discontinued, and that’s a tragedy for modern quilters as it’s a brilliant backing! £3 a metre, 60″ wide, great quality, goes with everything. We should run a campaign to bring it back! 1. Get the Missouri star quilt company 5″ rhombus template. 2. Choose 96 5″ printed charm squares. Lay your rhombus template diagonally across the charm square and rotary cut out the rhombus shape. You can stack 4 or 5 charm squares at a time for faster cutting. 3. Cut 192 white triangles from white cotton yardage. 4. Cut sixteen 8″ equilateral triangles. 5. Sew each diamond to two white triangles as shown in the Missouri star quilt company tutorial above, to make a triangle unit. Use up all the diamonds and triangles to make 96 triangle units. 6. Sew three triangle units together to make a “half star hexagon” shape. Repeat to use up all the triangle unit until you have 32 “half star hexagon” unit shapes. 7. Lay these units out in 8 rows, 4 in each row. You’ll need to lay them one facing up then one facing down, alternately to make them for together. Place an 8″ equilateral triangle at the beginning and end of each row. 8. 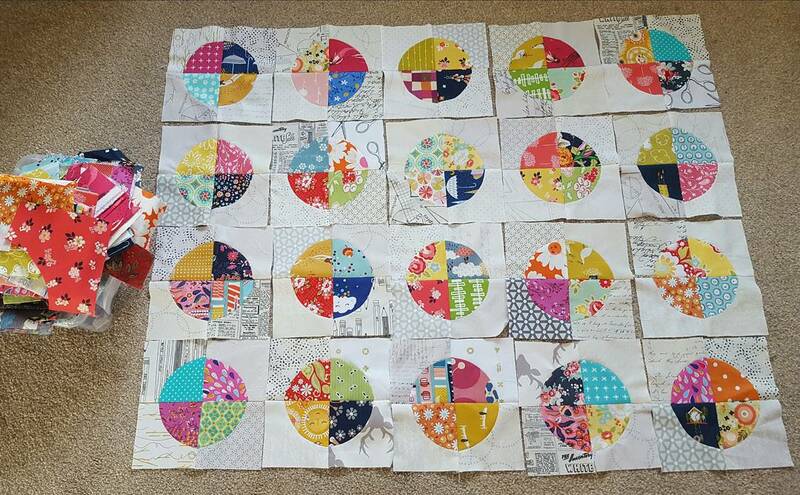 Sew these units together in rows. Then sew the rows together. 9. Trim the end equilateral triangles about 3/8ths inch away from the star unit seams to make the left and right edges straight. 10. Cut 5″ strips of white fabric, join until they’re long enough and add as borders. And you’ve finished your top! Here is a picture of my scrappy notes that I made to remind myself how I did it. Working this out beforehand would have saved a lot of time and fabric! No, it’s not pretty. But it works. And yes I made mistakes. Ugh. Feel privileged that I let you see this. It’s like letting your friends come over without tidying up. Now they’re real friends. Quick back to another pretty picture of the quilt that just magically appeared in a few hours from nothing! I’m actually considering giving this to my son’s teacher. 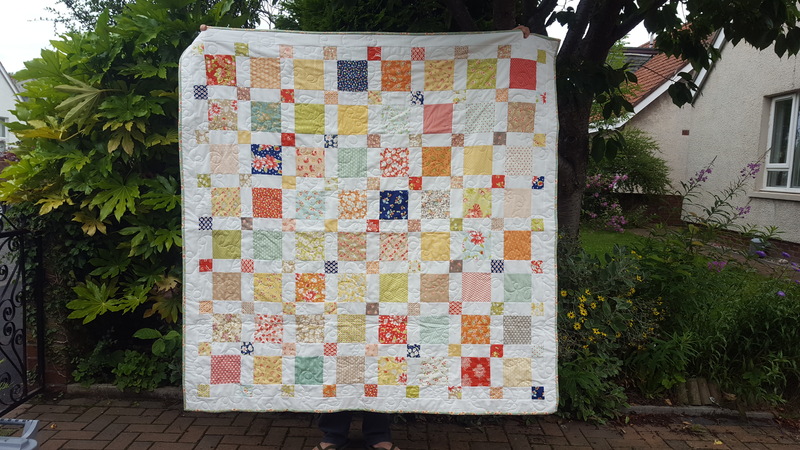 I only once gave quilts because those teachers literally turned out lives around ( https://www.google.co.uk/amp/s/cuckooblue.co.uk/2014/07/07/quilts-of-gratitude/amp/) . But he’s had the same teacher for 2 years, I like her, she’s been great, and this quilt has appeared just at the right time. Maybe it’s meant to be. Let me know if you have questions about making this quilt if you want to, I’m aware the tutorial isn’t as comprehensive as normal! Omigosh. I’ve wanted to make this quilt for years. Then I started and had doubts. Then I continued and had doubts. Then I sewed it together and I LOOOOVE it! It’s a drunkards path quilt. 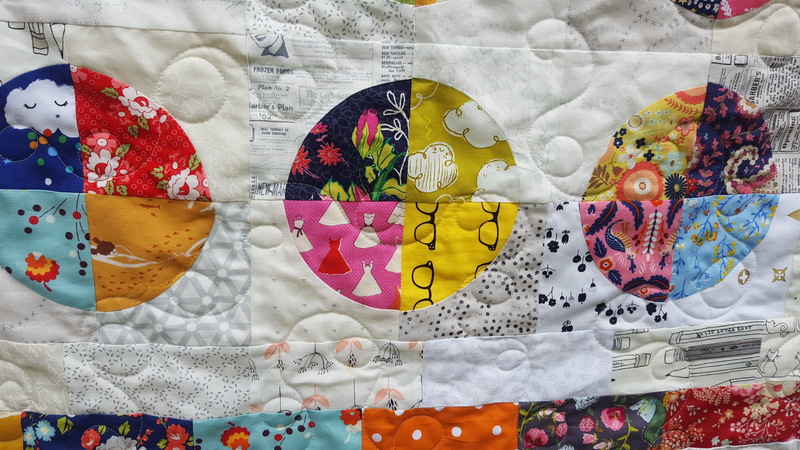 I’ve loved these pieced circles for so long, but I firstly I was concerned about cutting all those curves and secondly about sewing all those curves! Turns out there was really no need to worry. This was the first set of blocks I sewed. The template is great; I got it from Amazon but it’s made by Silesian Quilt and fits 5″ charm squares. 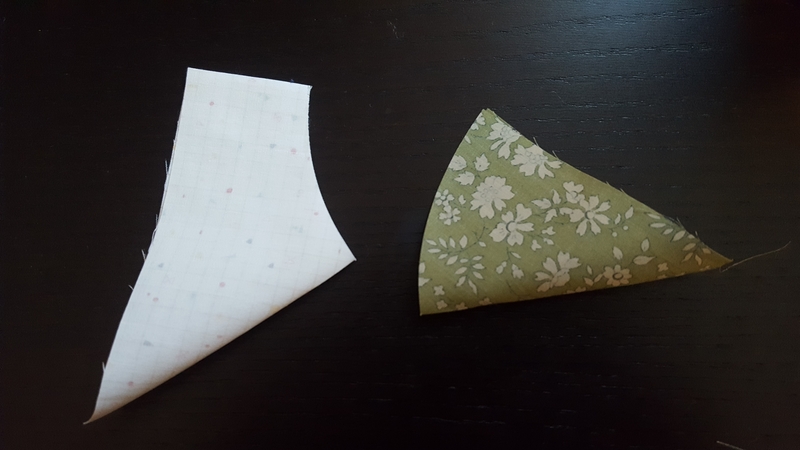 You can get both pieces out of one charm square, or two of the convex pieces, which is very useful if you only want circles from your printed charm squares like I did! 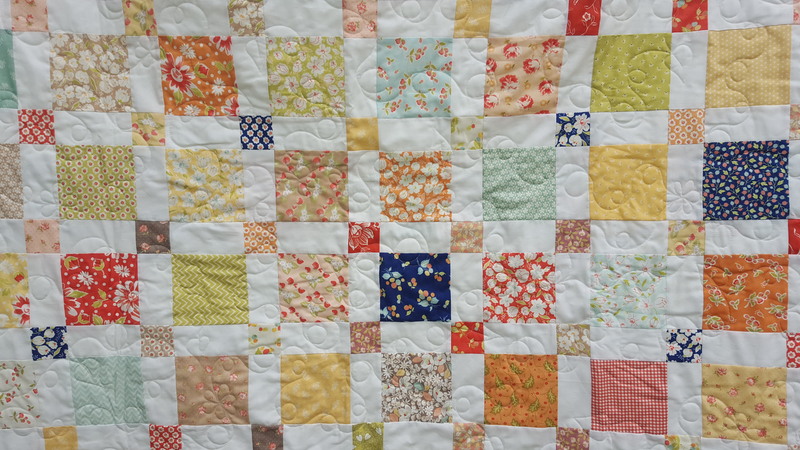 The individual block is 4.5″ when made up (4″ when sewn into the quilt). I got myself a 28″ rotary cutter to cut the curves – really easy. A normal 45″ wouldn’t fit into the curves and I didn’t want to use scissors (although you can of course!). 1. Mark the centres of the convex and concave curves by folding the shapes in half and finger pressing to make a mark. 4. Line up the top edge of the curve. Unlike any of the tutorials I’ve seen, I found my curves fitted better and lay flat when I matched the first part of the curve and not the top straight edges. This means there is a little triangle of background fabric showing as below. It looks weird, but works for me – the two edges look straight in the end. 5. Pin the top and bottom. You might not need to bother with three (or any) pins, I just like it better this way. 6. Sew curve, matching edges and sweeping any bunched-up fabric out of the way. I made a video of me doing one, it’s not brilliant, I know you’ll find better on the web, but it might help reassure you that these curves are not a problem. You might think it’s slow going, but this video is 36 seconds. That means, including pinning, you can do each block in about a minute, once you get into your stride. Not bad for a “difficult” block! These were my first nine and I wasn’t sure. They seemed garish, too low contrast… Just not as beautiful as I’d envisaged. The ever-supportive Instagram crowd, however, said they were the bees knees, so I persisted. I tried to create better contrast thereafter – at the time I was a lot happier with them, although now I think I was probably fussing over nothing! That’s my box of “uncut scraps” – i.e. not cut into strips or squares, which I do with some of my scraps. 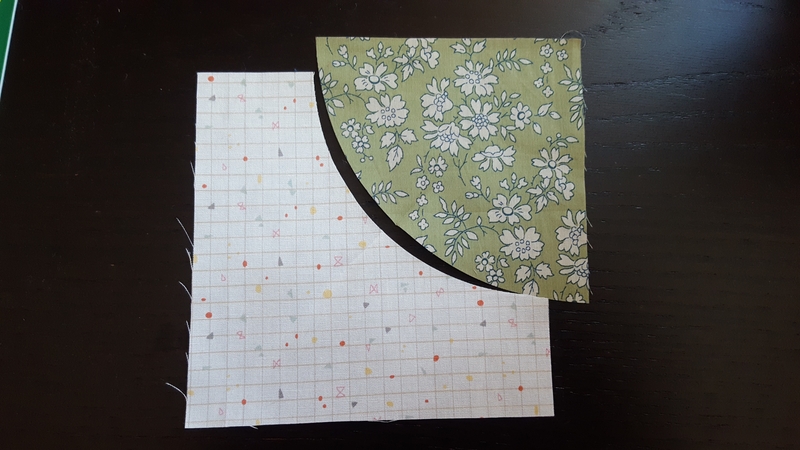 I used scraps because I wanted to test out whether I liked sewing curves and didn’t want to cut up fat quarters in case I abandoned it. I adore the scrappiness though… I wasn’t sure at first – but I think all the low volume fabrics calm down the crazy brights. I didn’t need to use any pattern, I made the blocks with the templates, sewed them together and trimmed them to 7.5″ square. 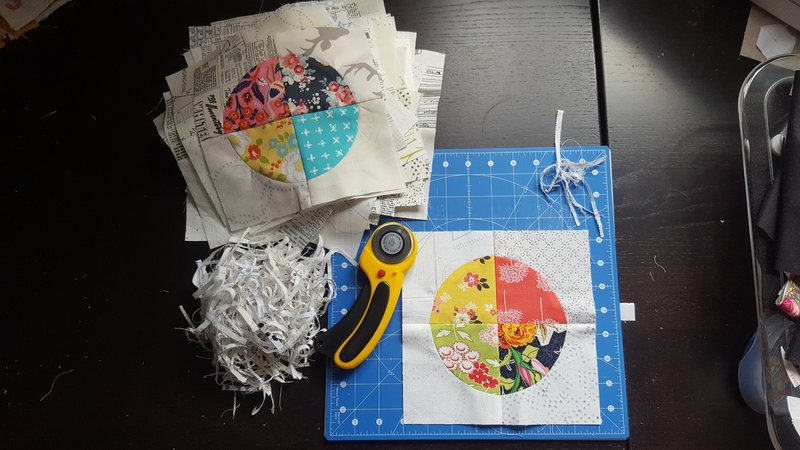 After that I just joined them together, made an inner and outer border of 2.5″ wide low volume scraps and middle border of 2.5″ wide bright prints and that was really that. The quilt finished at 58″ square. I used my favourite Quilters Dream Orient batting. I’ve been using Sew Simple light 100% cotton for a while, as I’d bought a half board of it, and whilst I liked it, I’d forgotten how soft and silky Dream Orient is, and how lovely it is to quilt with. And Quilters Dream Select cotton is not far behind the Orient. It is heavier than the Sew Simple light though and is heavier than my leaves quilt which is bigger. That suits me, but it pays to pick your batting to match your needs. 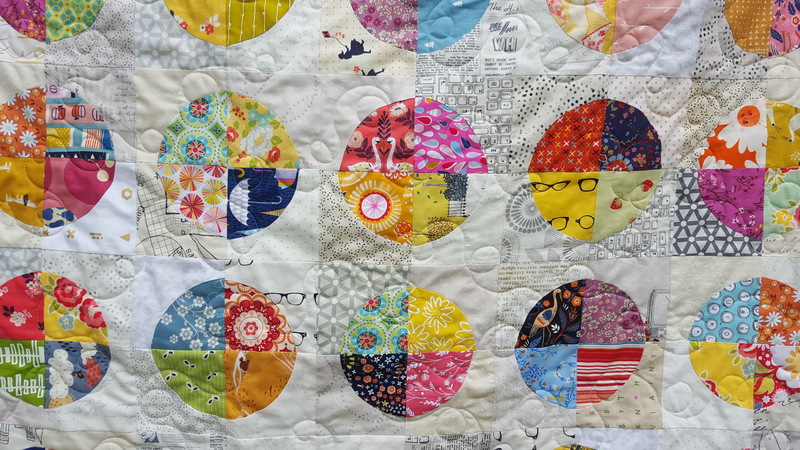 The quilting shows up nicely too and it’s a huge bonus that you can quilt 8″ apart. See that middle block? With the glasses and dresses? That’s my favourite of the whole quilt. It’s somehow really delicious. 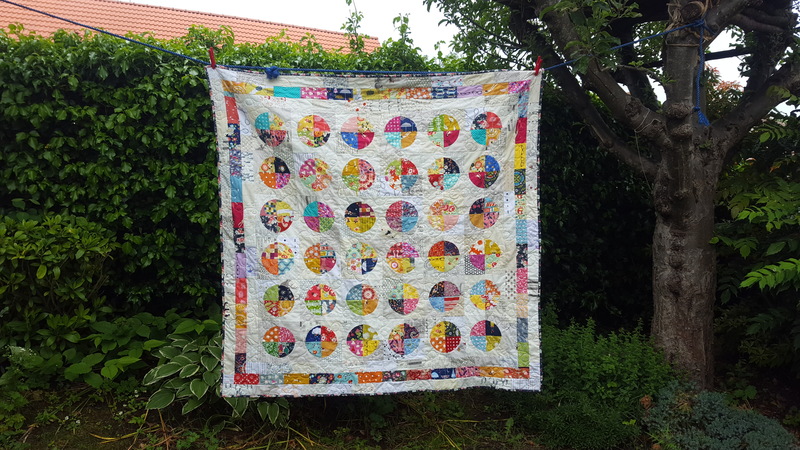 I quilted it with loops/”bubbles” to mimic the circles theme. Ahhh. 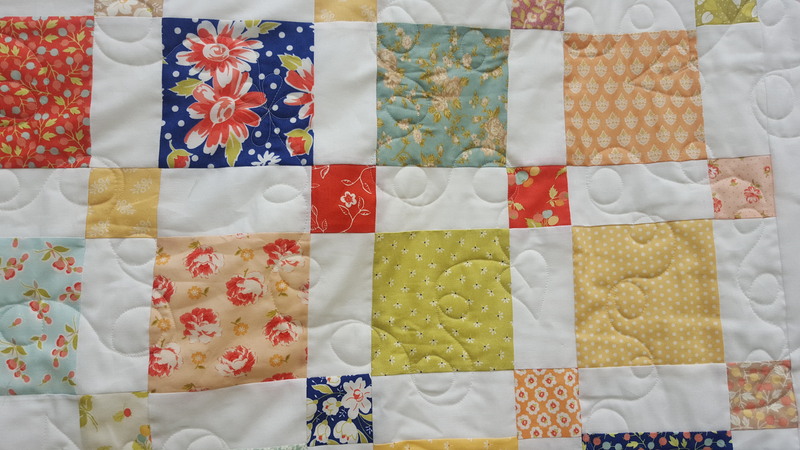 I’ve no idea what to do with this quilt as I kind of accidentally fell into making it, but I do really like it. Thanks to the cheerleaders on Instagram for making me stick with it when I was ready to make it into a cushion! I need to remember that the final quilt is always much nicer than the individual blocks. And on that note I’ll love you and leave you. P.s. 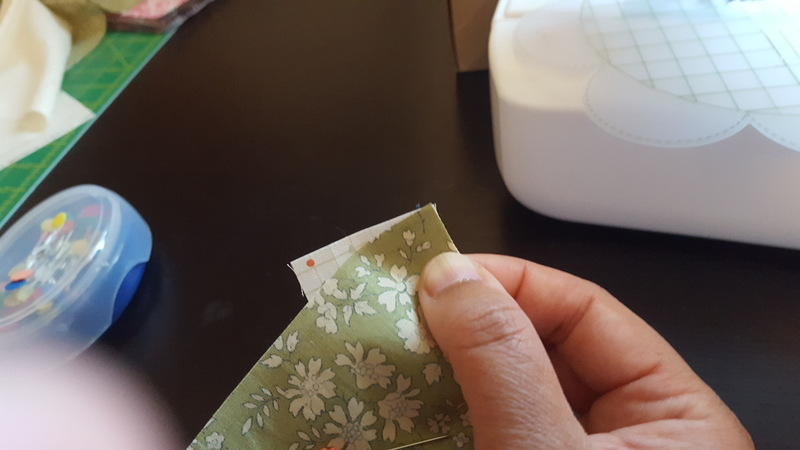 If you fancy making your own or even a few blocks for a pillow and didn’t want to buy an acrylic template, this Moda Bakeshop tutorial has a template for 5″ charm squares that you can cut it in cardboard or template plastic! The pictures are not working for me on the site, but at the bottom it says “printer friendly version” – click it and it opens a PDF showing all the pictures and the template. Have fun! It’s late spring here in Scotland – daisies, birdsong, yellow fields full of rapeseed flowers and even sunshine. No place for Autumn leaves? Oh, I think we could make allowances. 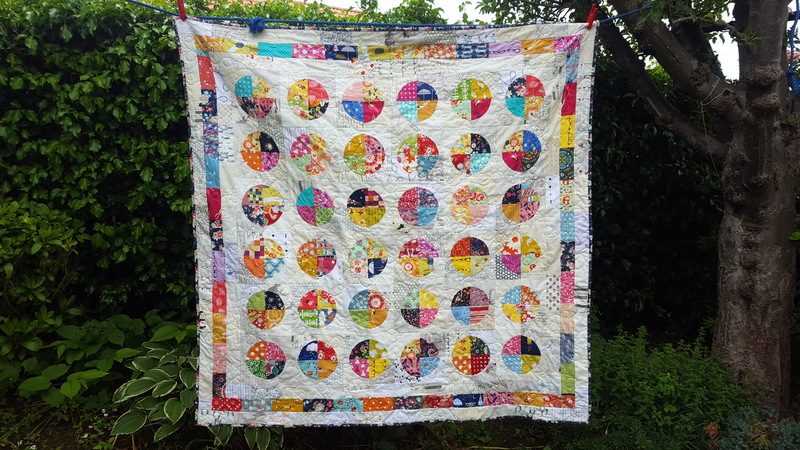 I can’t tell you how much I love this quilt! The pattern is Twirl by Fig Tree and Co. It’s charm pack and jelly roll friendly and I’ve never seen one I didn’t like. I think it’s the curling twirling stems which make it. For such a simple quilt pattern, it’s really pretty! 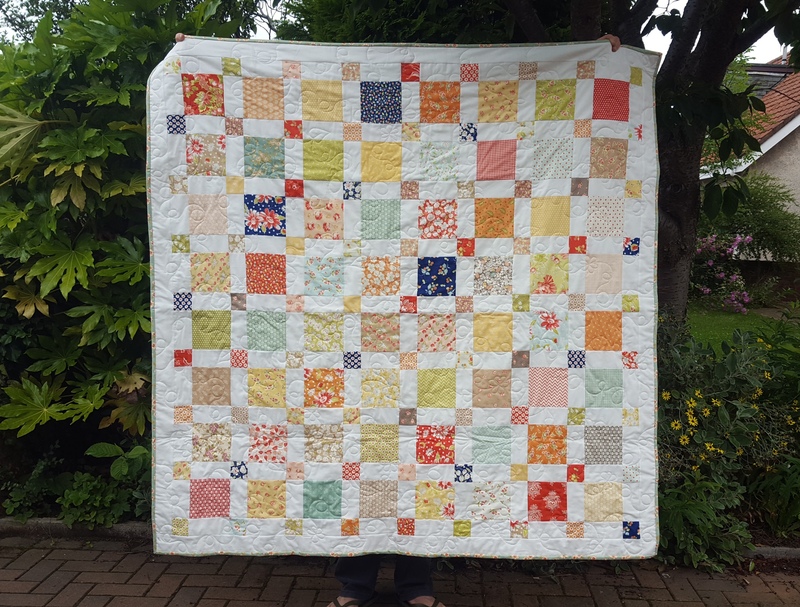 This is made with a variety of Fig Tree & Co fabrics from different collections including Honeysweet, Tapestry, Somerset, Breakfast at Tiffany’s, Farmhouse, Strawberry Fields Revisited, Butterscotch and Rose and my new favourite, Chestnut Street. 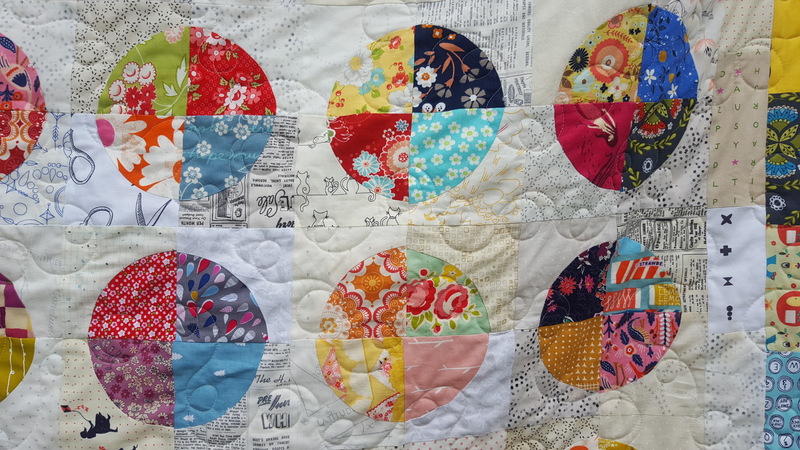 Many were charms and mini charms left over from my Fig Tree EPP hexagon quilt top (which is finished by the very way! 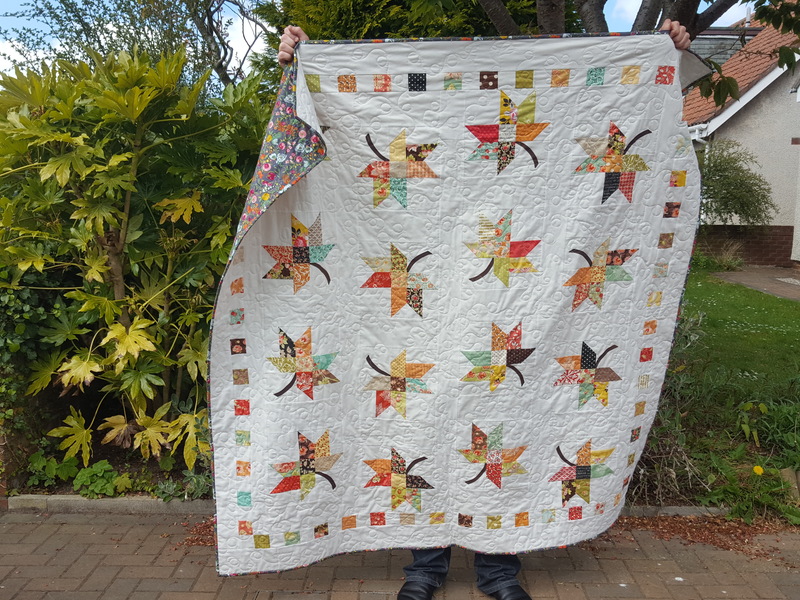 Another story for another day) – but this quilt looks equally as good using just one collection or other fabrics. 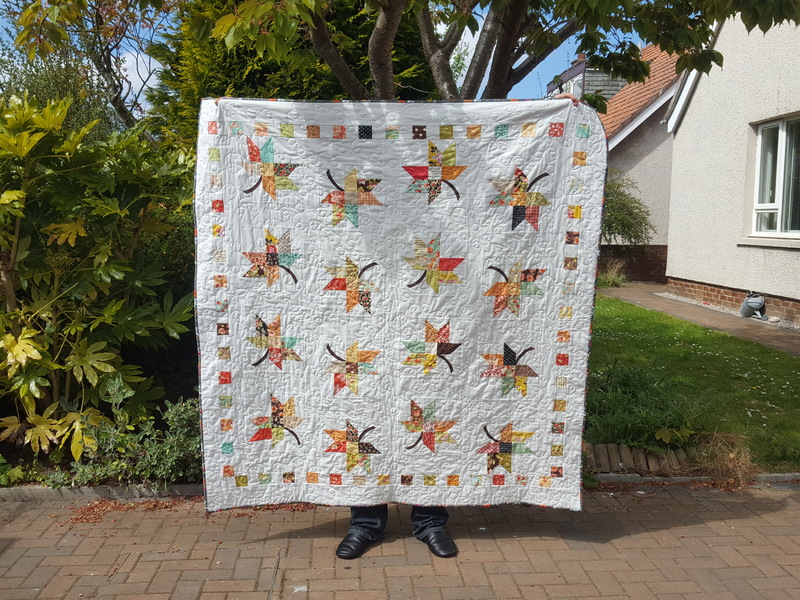 In fact it was seeing the beautiful version made by my friend @sewbernice on Instagram which made me finally move this quilt to the top of the “To Make” list! I did add a few extra yellows from Riley Blake’s Vintage Daydream collection as in the picture above. 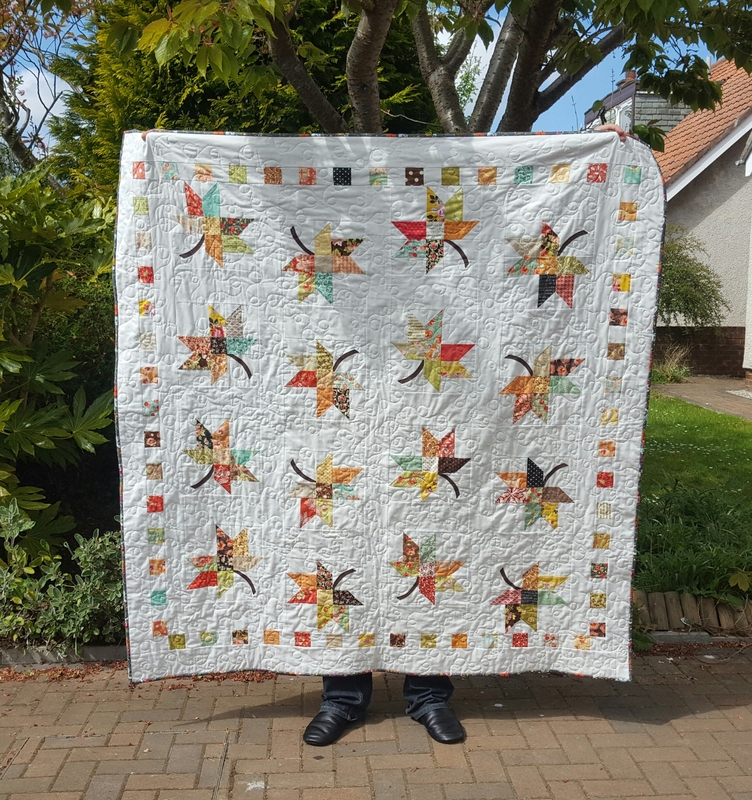 I love a bit of yellow in quilts – in this particular quilt it makes me think of Autumn sun on these softly falling leaves. I borrowed my mum’s spare bed to see what it looks like on a double bed as mine’s a king sized. And my room’s much messier! 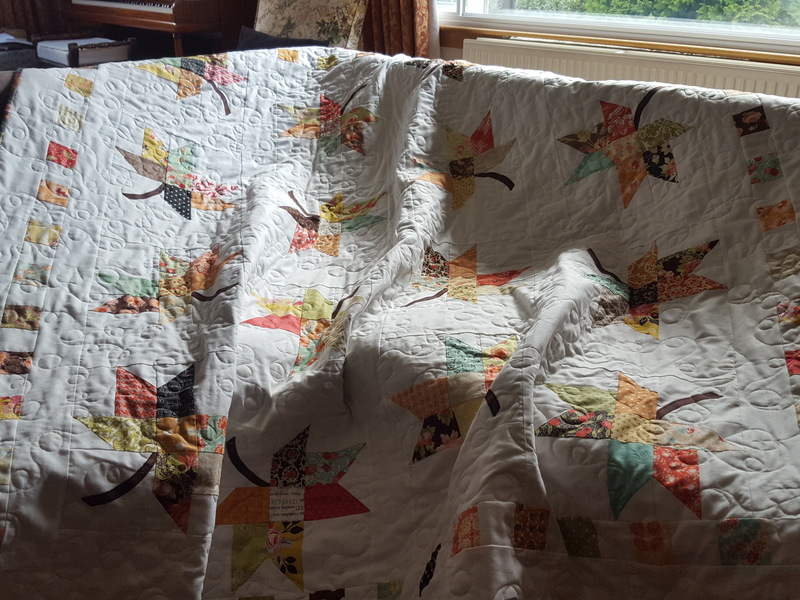 I shortened this quilt from the original pattern – it should be 4 leaves across by 5 leaves down, which would have made it fit the bed nicely. I had wanted it as a lap quilt (it’s approx 64″ ) but I think I’ll sleep under it in the summer. I probably shouldn’t have shortened the pattern after all. I’m a titch though, so it’s all good. 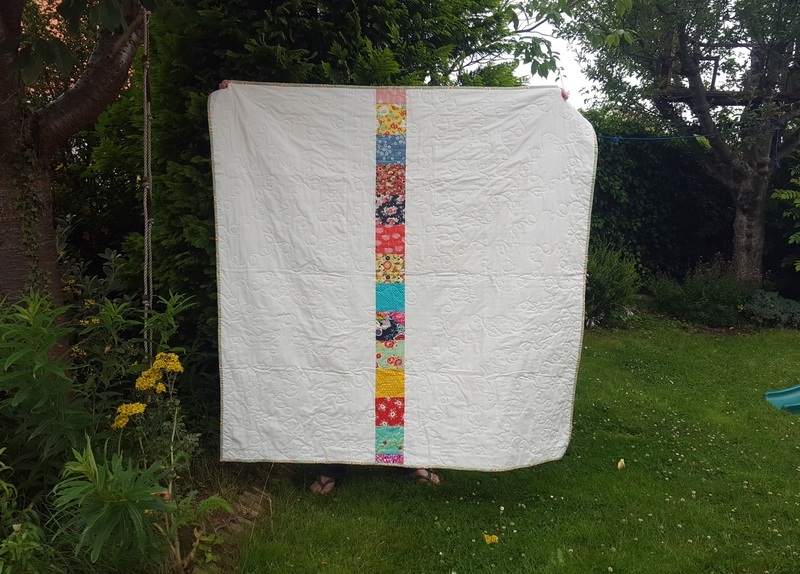 I used one of my favourite ever fabrics on the back – Budquette in Nightfall by Bari J. I had 4 metres stashed away, and much as it was painful to use it all up, I love that I will get to see it all the time. I love the back just as much as the front! 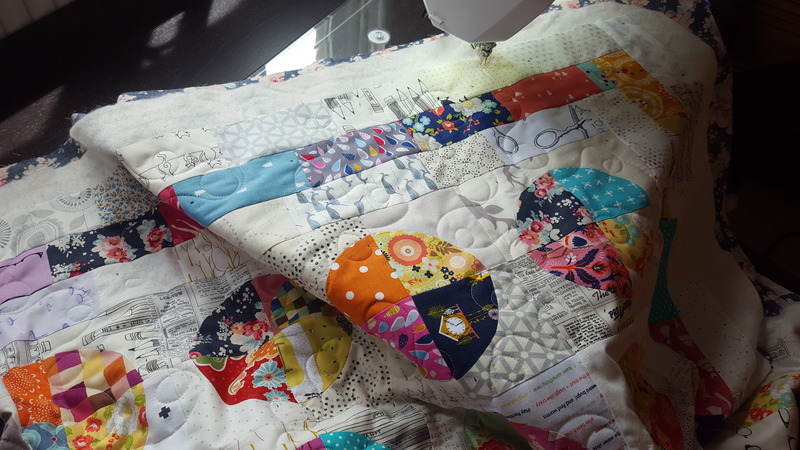 It’s difficult to use precious fabrics, and expensive to make backs from designer fabrics, but when it’s a quilt you are going to use, it’s worth it – you pretty much end up with a reversible quilt. 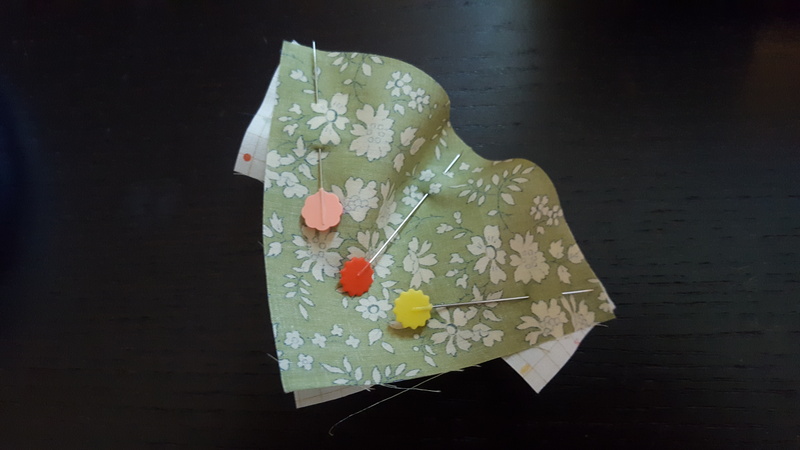 I used Sew Simple light 100% cotton batting, which is scrimless – you have to quilt it at least 4″ apart which means fairly dense quilting, but even so it is snuggly and drapes really well. Batting matters! I did an allover loopy leafy pattern with Superior Threads So Fine! Thread in the top and Bottom Line in the bobbin, which gives a nice fine quilting line on both sides. I’m certainly into this thread combination at the moment, and my machine likes it, but I’m not done with experimenting. No wonder quilting is an expensive hobby. So many options! Right, I’m off to snuggle a new quilt. Hope Spring is bringing you all much joy and creativity, my friends.